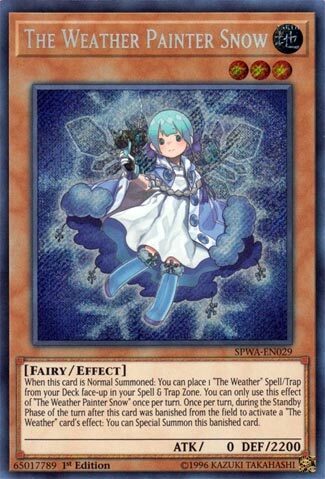 When this card is Normal Summoned: You can place 1 “The Weather” Spell/Trap from your Deck face-up in your Spell & Trap Zone. You can only use this effect of “The Weather Painter Snow” once per turn. Once per turn, during the Standby Phase of the turn after this card was banished from the field to activate a “The Weather” card’s effect: You can Special Summon this banished card. The Weather Painter Snow isn’t going to be attacking, but it has other abilities to make it a key player in the Weather Painter archetype. Strong DEF, Snow gets you a direct search to the field when Normal Summoned. “The Weather” spell/trap from the deck to being face-up on the field, you can bounce this monster back and use its effect again next turn. That effect is good, but its that inherited Weather Painter ability to Special Summon themselves back when banished via “The Weather” card effects that make it worthwhile. You only get the search off a Normal Summon, but a 2200DEF monster is nothing to scoff at, and it does provide itself as a Xyz or Link material. This a card you aren’t unhappy to see when topdecking, as it will fetch a card and you’ll be able to activate its effect immediately. Sadly, Magical Musketeers were not the only archetype to have their important cards short printed, The Weather Painters have this issue as well with their best Main Deck card, The Weather Painter Snow. The Weather Painter Snow allows you to activate a The Weather Spell/Trap from your deck upon Normal Summon only, thankfully because all of the Weather Painter Monsters have easy Special Summoning abilities. For those that don’t know, The Weather ___ Canvas card are the archetypal Spells and Traps all of the Weather Painter monsters rely on, and those Canvas cards let you give effects to Weather Painter monsters in the same column and adjacent columns, and most of the Canvas cards have good effects. Also to note the Canvas cards all give effects that make you banish your Weather Painter monsters, which is where the other effect that is on all of the Weather Painters comes in. If any Weather Painter is banished to activate the effect of a The Weather card, you can special summon it during the next Standby Phase to use the effects of specific Canvas cards again. The deck can keep control of the game very well if the deck is functioning properly and your opponent doesn’t have an out. The Weather Painters are a cool archetype that I personally like. The deck can keep the game to its own tempo, and if it is doing that well enough, you can summon the Link Monster to really put the nail in the coffin for the opponent. I like the concept of the deck and The Weather Painter Snow helps the deck work, it is really good.